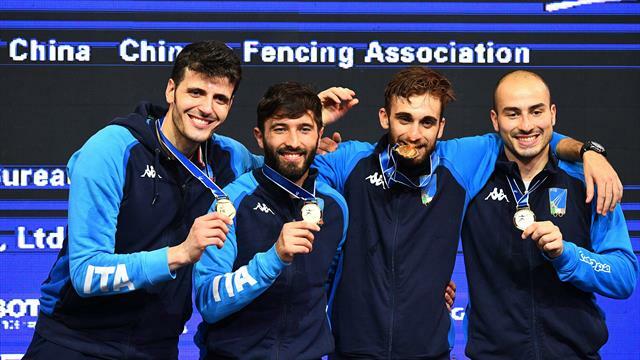 France took the gold medal in the women’s team sabre and Italy won the men’s team foil on the final night of fencing at the 2018 Fencing World Championships in Wuxi, China. France overcame stiff resistance from Russia to take the women’s team sabre world title, whilst Italy overcame the all-conquering USA team to secure the men’s team foil. Nineteen teams participated in the women’s team sabre event but it was the French women’s team who were eventually crowned winners, taking the title for the third time. They did so by beating Iran 45-31 at the last 16 stage, before encountering epic contests against China in the quarter-finals winning 45-42 and then Korea in the semi-finals by the same scoreline. That brought them to the Final and a meeting with seven-time world champion Russia and a fine display from the French saw them overcome their Russian counterparts 45-35 to take the gold medal. Russia had beaten Canada 45-27 at the last 16 stage, USA 45-42 in quarter-finals, before edging a dramatic semi-final with the defending champions Italy, 45-44. For Russian fencer Sofya Velikaya, a silver medal from this competition means she now has nine medals to her name in this event. Korea took the bronze medal over Italy, winning 45-40. A strong field of 27 teams competed in the men’s team foil competition and it was Italy who emerged world champions after a fine consistent performance. They overcame Australia 45-34 in the last 16, Poland 45-23 in the quarter-finals before progressing to the gold medal match after a 45-30 victory over Korea in the semi-finals. That meant a showdown with a USA team which had won every world cup and the zonal competition this year, as well as also taking silver last year in Leipzig. And the Americans had to settle for silver again as the Italian quartet was victorious, taking the title with a 45-34 scoreline. This is the third successive gold medal in the men’s team foil for Italy, for the first time in its history, meaning it has now won this event 17 times overall. Italian fencer Andrea Cassara now has 11 medals overall in this event, including seven golds. The USA team’s route to the Final saw them beat Hungary 45-26 in the last 16, China 45-19 in the quarter-finals, before beating Russia in the semi-finals, 45-29. Russia did have the consolation of taking home the bronze medal after beating Korea, 45-35.